Steiglitz is an almost deserted mining town immediately south of the Brisbane Ranges National Park, 65 km south-west of Melbourne and 30 km north of Geelong. It was named after the von Stieglitz family of pastoralists who came to Port Phillip from Launceston in 1835, and settled north of Geelong the following year. The town is on Sutherland Creek where gold was discovered in 1854, a year after the von Stieglitz family left Australia to return to Ireland. The area was described as Steiglitz Forest, and the goldfield adapted the name Steiglitz, not Stieglitz (the family's spelling). By 1856 there were several quartz crushing plants, and within two years there was a Wesleyan chapel, a court house and Wesleyan, Anglican, Catholic and Presbyterian schools. A borough council was proclaimed on 27 October 1865, administering 23 sq km. By the early 1860s mining was carried out by companies, and most miners were employees, apart from 220 Chinese who worked alluvial sources. This was a few years before only one mine was being worked. Mining ceased in 1941. The population left there engaged in firewood cutting and grazing. 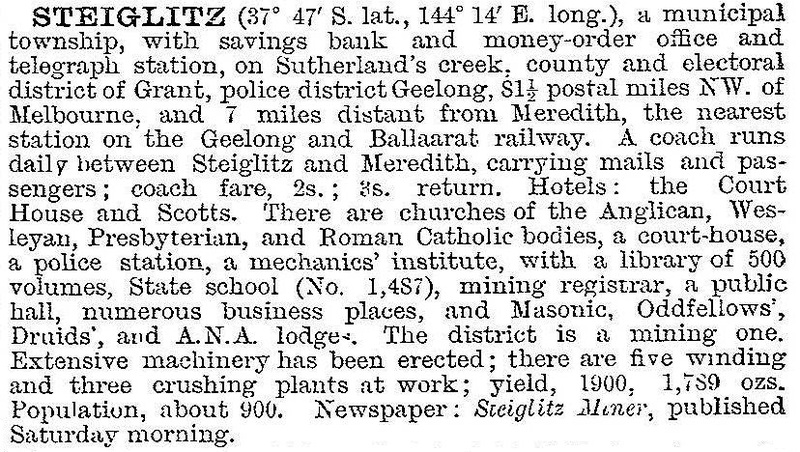 At the height of its activities Steiglitz had a recreation reserve (1863) at which cricket and football teams played in local competitions. A racetrack was opened intermittently, a tennis club played into the 1900s, a rifle club held fancy dress balls and the Australian Natives Association had its own hall. After the 1940s, buildings were removed from the township (for example the Catholic church to Norlane). In 1946 the school closed for three years and reopened until finally closing in 1960. The Steiglitz historic park was opened in 1976, and the court house was restored as an information centre. It is on the Victorian Heritage Register. The Steiglitz historic site of 8 sq km is on the Register of the National Estate. It reputedly had 2000 people in 1863.